Justin Bieber is on a trip. It’s a trip to the visitor’s book in Anne Frank House. He writes a comment that she “would have been a belieber”. It causes an international storm. The entire universe resolves never to mesh historical tragedy with modern pop culture ever again. Understandably, then, the Library Theatre’s latest project has raised a few eyebrows. Their final production during their geographical exile is a site-specific performance that clashes the horrific killing of Protesters in Peterloo in 1819 with the pill-chugging, day-glo culture of 1989 rave Britain. Is Manchester Sound: The Massacre a Bieber moment? Or do two very different protests against their current world orders have a similar story to tell? This is how Manchester Sound worked. On a grey evening, we were herded into a car park and harangued by young ravers asking for drugs and offering us fanzines for 50p. Leggings, smiley faces, lots of gum and plenty of gumption. We were led to the Manchester Sound venue, which is easy to find: it’s down the street next to thingies, I forget the name, you know, the one with the windows. And once inside, we were transported to another world. Truly. The set design offered delight after delight, the sound staging was deceptively clever and the stark reality of the plot was emphasised by beautiful lighting. We walked from an utterly convincing rave scene into a bawdy 19th century pub, with everybody in the place bustling around the set like confused extras while, in a wonderful sleight of hand, the actors quick-changed from character to character without us noticing. The play seemed built around us. They leaned on us, spoke to us, screamed at us. I even scored drugs off a DJ. Scenes were interspersed with moody video montages courtesy of the Olivier award-winning Timothy Bird, and perhaps that offered a televisual point of focus throughout, but with the performance so in-your-face, it was difficult to make an objective judgement of the event. With actors above you, beside you and sometimes at your feet, I doubt there were two people that had the same experience. Very postmodern. The story span a chronological kaleidoscope before our eyes: ravers looking into the past, St Peter's Field protesters fearing for their future, and the ghosts of the forgotten walking among us all often to chilling effect. 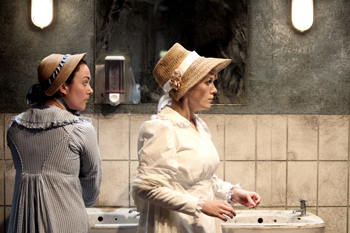 In both eras, it was the story of the women that mattered, played with heartbreaking vulnerability by Rachel Austin, Janey Lawson and Leash Hackett – and a story told not just through the big events of the time but with beautiful detail: a bobbin of cotton tellingly left uncut in a chill-out room; a hilarious toilet scene which posed some big questions about emancipation among its tomfoolery. And writing as a raver and not a historian, therein lied its flaw. The rave movement was deeply political: they fought against authority in a way modern clubbers are perhaps only beginning to truly understand. It was a chemical-induced togetherness that proved useful in the fight against the Criminal Justice Bill and against the corporate excesses of the 80s. And yet it was a fight that wasn’t clearly won: the Bill became an amended Act while raves such as Tribal Gathering became commercialised. The ravers of Manchester Sound demanded our empathy because of the strength of their performance, but set against the weight of Peterloo, their journey seemed empty. When Pete Ashmore’s Samuel Bamford faced pills, thrills and bellyaches for the first time in one of the production’s many reality-blurring scenes, he declared in awe that the drug ecstasy “is what brings them together”. He was right, but it also highlighted a problem with the comparison: rave culture’s hollow hedonism just didn’t translate to the fierce struggle for personal independence in the days of Peterloo. The stories wove into each other cleverly, with great pathos and comedy, but while the white-clothed women radicals faced up to Adam Fogerty’s towering red-coated policeman, their 1989 counterparts seemed stuck in a world in which they chased male DJs and lost their minds in clubs run by men. From emancipation to ecstasy nation. Such questions will hang in the air once one leaves the remarkable venue, but it shouldn’t test one too much: the debate the production caused was part of the enjoyment. 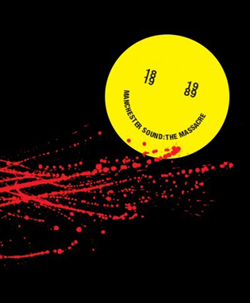 Manchester Sound: The Massacre was such an original and immersive experience, it will stick in the memory like a rave chord on loop. My heart leapt for the characters, I gasped when a new set was revealed and the titular massacre will play in my dreams for a while to come. Manchester Sound was a brave performance, flawed and beautiful; a clumsy metaphor that thrilled me to the bones. Enjoy the trip. And it is a trip.